Now you have an all-in-one solution to managing your Driver Qualification Files and California Employer Pull Notice Program. e-ComplianceManager.com has received approval from the California Department of Motor Vehicles to provide Pull Notices as an authorized EPN Agent. Our auto enroll/drop feature automatically adds and deletes drivers from your DMV Pull notice roster as drivers are entered and deleted from your e-ComplianceManager.com account. This simplifies the add/delete process and assures that your EPN roster remains current. The auto-process feature will automatically request a new Pull Notice from the DMV 3 days (weekends excluded) prior to their existing Pull Notice expiration date. Relieve the stress of worrying about expired Pull Notices. Order Pull Notices directly from our Control Panel with just a single click of a button. 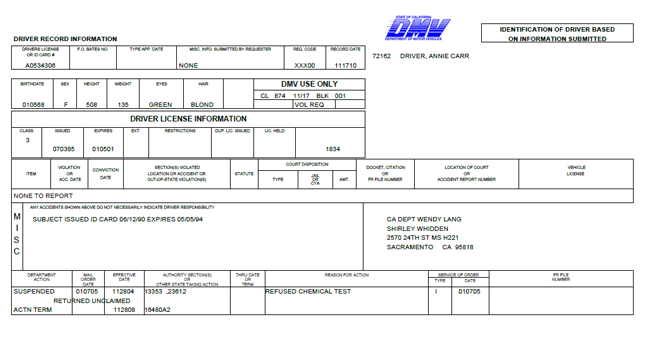 With our fully integrated process the driver's Medical Evaluation date and CDL expiration date is automatically reviewed when you print the driver's pull notice. As is the case with all of our services, the driver's Pull Notice date is electronically monitored and you and your authorized users receive email alerts as each driver's Pull Notice nears its expiration date. Our MVR Services are available to all enrolled Members for no additional annual fees. Call today for more information. We make the ECM SITES available subject to this Agreement (including any additional guidelines, rules, terms and conditions as referenced below). By registering and/or enrolling for, or otherwise accessing or using, any ECM SITE (or any portion of an ECM SITE), you agree to the terms of this Agreement. If you do not agree to this Agreement, you may not register for, or otherwise access or use, the ECM SITES. We may update or make changes to this Agreement from time to time and we may provide you notice of these changes by any reasonable means, including by posting the revised version of this Agreement on the ECM SITES. You can determine when we last updated this Agreement by referring to the "LAST UPDATED" legend at the top of this Agreement. Accessing or using any ECM SITE following changes to this Agreement will constitute your acceptance of those changes. For clarity, however, any such changes will not apply to any dispute between you and us arising prior to the date on which we posted the revised Agreement incorporating such changes, or otherwise notified you of such changes. Certain products, services, functionality, content or materials available on or through the ECM SITES may also be subject to additional guidelines, rules, terms and conditions. If you access, use or purchase such products, services, functionality, content or materials, then you will also be subject such additional guidelines, rules, terms and conditions, all of which are hereby incorporated by reference into this Agreement. The ECM SITES are controlled and operated from the United States, and are not intended to subject us to the laws or jurisdiction of any state, country or territory other than those of the United States. We do not represent or warrant that the ECM SITES are appropriate or available for use in any particular jurisdiction other than the United States. In choosing to access and use the ECM SITES, you do so on your own initiative and at your own risk, and you are responsible for complying with all local laws, rules and regulations. You are also subject to United States export controls and are responsible for any violations of such controls, including any United States embargoes or other federal rules and regulations restricting exports. We may limit the availability of any ECM SITE, in whole or in part, to any person, geographic area or jurisdiction we choose, at any time and in our sole discretion. Post, transmit, or otherwise make available any materials that are or may be: (a) threatening, harassing, degrading, hateful or intimidating; (b) defamatory, libelous, fraudulent or otherwise tortious; (c) obscene, indecent, pornographic or otherwise objectionable; or (d) protected by copyright, trademark, trade secret, right of publicity or privacy or any other proprietary right without the express prior written consent of the applicable owner. Post, transmit or otherwise make available any virus, worm, Trojan horse, Easter egg, time bomb, spyware or other computer code, file or program, or take any action (including any denial of service attack, script injection attack, redirection attack, SQL injection attack, or session hijacking), that is or may be harmful or invasive or intended to damage or hijack the operation of, or to monitor the use of, any hardware, software or equipment. Use any ECM SITE for any fraudulent, tortious or unlawful purpose. Harvest or collect information about other users of any ECM SITE. Impersonate any person or entity; falsely state or otherwise misrepresent your affiliation with us or the ECM SITES or any other person or entity; or express or imply that we endorse any statement you make. Interfere with or disrupt the operation of any ECM SITE or the servers or networks used to make the ECM SITES available; or violate any requirements, procedures, policies or regulations of such networks. Restrict or inhibit any other person from using any ECM SITE (including by hacking or defacing any portion of a ECM SITE). Reproduce, modify, adapt, translate, create derivative works of, sell, rent, lease, loan, timeshare, distribute or otherwise exploit any portion of (or any use of or access to) any ECM SITE except as expressly authorized herein. Reverse engineer, decompile or disassemble any portion of any ECM SITE, except where such restriction is expressly prohibited by applicable law. Remove any copyright, trademark or other proprietary rights notice from any ECM SITE or materials obtained from any ECM SITE. Frame or mirror any portion of any ECM SITE, or otherwise incorporate any portion of any ECM SITE into any product or service, except as expressly authorized herein. Systematically download or store ECM SITE content (other than reports or similar content that are specifically made available by us to you for download through the ECM SITES). Use any robot, spider, search/retrieval application or other manual or automatic device to retrieve, index, "scrape", "data mine" or in any way gather ECM SITE content or reproduce or circumvent the navigational structure or presentation of any ECM SITE. Notwithstanding the foregoing, we grant operators of public search engines permission to use spiders to copy materials from the ECM SITES for the sole purpose of, and solely to the extent necessary for, creating publicly available searchable indices of the materials, but not caches or archives of such materials. We reserve the right to revoke these exceptions either generally or in specific cases. You may be required to register and be granted a user name and password before you can use or access portions of the ECM SITES. We may reject, or require that you change, any user name, password or other information that you provide to us in registering. Your user name and password are for your personal use only and should be kept confidential; you, and not ECM, are responsible for any use or misuse of your user name or password, and you must promptly notify us of any confidentiality breach or unauthorized use of your user name or password, or your ECM SITE account. By registering with any ECM SITES, or accessing or using any ECM SITE, you represent and warrant that you are of legal age to enter into and be bound by this Agreement. You may not register with, or access or use, the ECM SITES if you are not of legal age. We may, at any time and with or without notice, temporarily or permanently modify, suspend or discontinue any ECM SITE in whole or in part; charge in connection with the use of any ECM SITE; modify or waive any fees charged in connection with any ECM SITE; or offer opportunities to some or all users of any ECM SITE. You agree that we are not liable to you or to any third party for any modification, suspension or discontinuance of any ECM SITE, or of any products, services, content, or functionality offered on or through any ECM SITE. Your continued use of ECM SITES after such changes will indicate your acceptance of such changes. If you purchase any products or services through an ECM SITE or use any ECM SITE to pay bills or conduct any other transaction (each such purchase or other transaction, a "Transaction"), you may be asked to supply certain relevant information, such as your credit card number and its expiration date, your billing address and your shipping information. You represent and warrant that you have the right to use any credit card that you submit in connection with a transaction. By submitting such information, you grant to us the right to provide such information to third parties for purposes of facilitating Transactions. Verification of information may be required prior to the acknowledgment or completion of any Transaction. By making a Transaction, you represent that the applicable products and services will be used only in a lawful manner. We reserve the right, with or without prior notice, to limit or discontinue the availability of any product or service; to change the price of any product or service; to impose conditions on any coupon, discount or similar promotion; to bar any user from making any Transaction; and to refuse to provide any user with any product or service. Refunds and exchanges will be subject to our applicable refund and exchange policies. You agree to pay all charges incurred by you or on your behalf through any ECM SITE, at the prices in effect when such charges are incurred. In addition, you are responsible for any taxes applicable to your Transactions. While it is our practice to confirm orders by e-mail, the receipt of an e-mail order confirmation does not constitute our acceptance of an order or our confirmation of an offer to sell or provide a product or service. The ECM SITES may provide functionality that enables you to upload or submit information, content or materials, including through discussion forums and message boards, user profiles, chat and commenting functionality, or other interactive features (such information, content and materials, "Submissions"). You will retain ownership of any intellectual property rights that you may have in such Submissions, and you hereby grant to us a worldwide, non-exclusive, transferable, sublicenseable (through multiple tiers), royalty-free, perpetual, irrevocable right and license, without additional compensation to you or any third party: to use, disclose, reproduce, distribute, adapt (including to edit, modify, translate and reformat), create derivative works of, transmit, publicly display, publicly perform and otherwise exploit such Submissions, in any media now known or hereafter developed. If you choose to make any of your personally identifiable or other information publicly available through the ECM SITES, you do so at your own risk. If you make any comments or suggestions to us or any of our employees, officers, directors, affiliates, agents, representatives, licensors, suppliers or service providers (collectively, "Affiliated Entities") with respect to any ECM SITES or any products or services that we or any Affiliates Entities provide ("Feedback"), then such Feedback will be deemed a Submission and will be subject to the license granted above, and you hereby acknowledge and agree that such Feedback is not confidential, and that your provision of such Feedback is gratuitous, unsolicited and without restriction, and does not place us or any Affiliated Entities under any fiduciary or other obligation. You represent and warrant that you have all rights necessary to grant the licenses granted in this section, and that your Submissions, and your provision of Submissions through or in connection with the ECM SITES, are complete and accurate, and are not fraudulent, tortious or otherwise in violation of any applicable law or any right of any third party. You further irrevocably waive any "moral rights" or other rights with respect to attribution of authorship or integrity of materials regarding any Submission that you may have under any applicable law under any legal theory. We may (but have no obligation to) monitor, evaluate, alter or remove Submissions before or after they appear on the ECM SITES. We may disclose any Submissions and the circumstances surrounding their transmission to anyone for any reason or purpose. The ECM SITES are and will remain the property of ECM and its licensors and suppliers, and may be protected by copyright, trademark, trade secret, patent and other proprietary rights and laws. Subject to your compliance with this Agreement, you may access and use the ECM SITES for their intended purposes as described in this Agreement, as and in the form provided by ECM, unless and until ECM terminates your use or access. Our trade names, trademarks and service marks include "ECM," "e-ComplianceManager," "e-ComplianceManager.com," "Pull Notice.com," "Pull Notices.com," and "myDQFiles.com," and associated marks and logos, among others. All trademarks, service marks, trade names and logos on the ECM SITES not owned by ECM are the property of their respective owners. You may not use any of our trademarks, service marks, trade names or logos in connection with any product or service that is not ours or in any manner that is likely to cause confusion. Nothing contained on the ECM SITES should be construed as granting, by implication, estoppel or otherwise, any license or right to use any of our trademarks, service marks, trade names or logos. The ECM SITES may provide links to other websites and online resources, or otherwise make available access to third party materials including Submissions (all such links, resources and materials, "Third Party Materials"). We neither control nor endorse, nor are we responsible for, any Third Party Materials, including the accuracy, integrity, quality, legality, usefulness or safety of Third Party Materials. Certain Third Party Materials may, among other things, be inaccurate, misleading or deceptive. Nothing in this Agreement will be deemed to be a representation or warranty by us or any Affiliated Entity with respect to any Third Party Materials. We have no obligation to monitor Third Party Materials, and we may block or disable access to any Third Party Materials at any time. In addition, the availability of any Third Party Materials through the ECM SITES does not imply our endorsement of, or our affiliation with, any provider of such Third Party Materials, nor does such availability create any legal relationship between you and any such provider. Your use of Third Party Materials is at your own risk and is subject to any additional terms, conditions and policies applicable to such Third Party Materials (such as terms of service or privacy policies of the providers of such Third Party Materials). THE ECM SITES are PROVIDED TO YOU "AS IS" WITHOUT ANY WARRANTIES OF ANY KIND, WHETHER EXPRESS, IMPLIED OR STATUTORY. YOU AGREE THAT YOU MUST EVALUATE, AND THAT YOU BEAR ALL RISKS ASSOCIATED WITH, THE USE OF THE ECM SITES, INCLUDING ANY RELIANCE ON THE ACCURACY, COMPLETENESS OR USEFULNESS OF ANY products, services, functionality, information, content and materials AVAILABLE THROUGH OR IN CONNECTION WITH THE ECM SITES. ECM and the Affiliated Entities DISCLAIM ALL WARRANTIES WITH RESPECT TO THE ECM SITES TO THE FULLEST EXTENT PERMISSIBLE UNDER APPLICABLE LAW, INCLUDING THE WARRANTIES OF MERCHANTABILITY, FITNESS FOR A PARTICULAR PURPOSE, NON-INFRINGEMENT, AND TITLE. While we try to maintain the integrity and security of the ECM SITES and the servers from which the ECM SITES are operated, we do not guarantee that the ECM SITES will be or remain secure, complete or correct, or that access to the ECM SITES will be uninterrupted. The ECM SITES may include inaccuracies, errors and materials that violate or conflict with this Agreement. Additionally, third parties may make unauthorized alterations to the ECM SITES. If you become aware of any unauthorized third-party alteration to any ECM SITES, contact us at memberservices@e-compliancemanager.com with a description of the materials at issue and the URL or location on the ECM SITES where such materials appear. ECM AND THE AFFILIATED ENTITIES WILL NOT BE LIABLE FOR ANY INDIRECT, INCIDENTAL, CONSEQUENTIAL, SPECIAL, EXEMPLARY OR PUNITIVE DAMAGES OF ANY KIND, UNDER ANY CONTRACT, TORT (INCLUDING NEGLIGENCE), STRICT LIABILITY OR OTHER THEORY, INCLUDING DAMAGES FOR LOSS OF PROFITS, LOSS OF USE, OR LOSS OF OR DAMAGE TO DATA OR INFORMATION, EVEN IF ADVISED IN ADVANCE OF SUCH DAMAGES OR LOSSES. YOUR SOLE AND EXCLUSIVE REMEDY FOR DISSATISFACTION WITH THE ECM SITES IS TO STOP USING THE ECM SITES. THE TOTAL MAXIMUM LIABILITY OF ECM AND THE AFFILIATED ENTITIES ARISING FROM OR RELATING TO THE ECM SITES OR THIS AGREEMENT WILL BE THE GREATER OF (A) THE TOTAL AMOUNT, IF ANY, PAID BY YOU TO ECM TO ACCESS AND USE THE ECM SITES OR (B) $100. Applicable law may not allow for limitations on certain implied warranties, or exclusions or limitations of certain damages; solely to the extent that such law applies to you, some or all of the above disclaimers, exclusions or limitations may not apply to you, and you may have certain additional rights. Except to the extent prohibited under applicable law, you will defend, indemnify and hold harmless ECM and the Affiliated Entities from and against all claims, losses, costs and expenses (including attorneys� fees) arising out of or related to (a) your use of, or activities in connection with, the ECM SITES; (b) any activity related to your account or use of your log-in information or password (whether by you or by a third party with or without your consent); (c) your Submissions, including any claim by any third party that your Submissions infringe, misappropriate or otherwise violate any rights of such third party, including any intellectual property rights, rights of privacy or publicity, or contractual rights, or are libelous, defamatory or obscene; (d) your use of, or in connection with any information, without regard to its accuracy, contained on any Motor Vehicle Reports generated by ECM SITES ; or (e) any breach or violation (or claim that, if true, would be a breach or violation) of this Agreement by you. We, in our sole discretion, may terminate your access to and use of all or any portion of the ECM SITES, at any time and for any reason, including if we believe that you have violated or acted inconsistently with the letter or spirit of this Agreement. Upon any termination, your right to access and use the ECM SITES will immediately cease and the other provisions of this Agreement will continue and survive. You agree that any termination of your access to or use of the ECM SITES may be effected without prior notice, and that we may immediately deactivate or delete your password and user name (if any), and all related information and files associated with it (including your Submissions). You agree that ECM and the Affiliated Entities will not be liable to you or any third party for any termination of your access to or use of the ECM SITES. You agree that this Agreement (and any claim or dispute arising in connection with this Agreement or your use of the ECM SITES) is governed by and will be construed in accordance with the laws of the State of California, U.S.A., without regard to its principles of conflicts of law, and you consent to the exclusive jurisdiction of the federal and state courts located in Martinez, California, U.S.A., and waive any jurisdictional, venue, or inconvenient forum objections thereto. If you have any questions regarding the ECM SITES, please direct such questions to MemberServices@e-complianceManager.com. Please note that e-mail communications will not necessarily be secure; accordingly you should not include any confidential or sensitive information in your e-mail correspondence with us. Pursuant to 47 U.S.C. Section 230(d) as amended, we hereby notify you that parental control protections (such as computer hardware, software or filtering services) are commercially available that may assist you in limiting access to material that is harmful to minors. Information identifying current providers of such protections is available on the websites GetNetWise (http://kids.getnetwise.org/) and OnGuard Online (http://onguardonline.gov/). Please note that we do not endorse any of the products or services listed at such sites. Under California Civil Code Section 1789.3, California users are entitled to the following consumer rights notice: If you have a question or complaint regarding any ECM SITE, please send an e-mail to MemberServices@e-complianceManager.com. You may also contact us by writing to ECM Enterprises, PO Box 667, Oakley, CA 94561, Attn: Legal Department. California residents may reach the Complaint Assistance Unit of the Division of Consumer Services of the California Department of Consumer Affairs by mail at 1625 North Market Blvd., Sacramento, CA 95834, or by telephone at (916) 445-1254 or (800) 952-5210. The Digital Millennium Copyright Act of 1998 (the "DMCA") provides recourse for copyright owners who believe that material appearing on the Internet infringes their rights under U.S. copyright law. If you believe in good faith that materials available on any ECM SITE infringe your copyright, you (or your agent) may send us a notice requesting that we remove the material or block access to it. If you believe in good faith that someone has wrongly filed a notice of copyright infringement against you, the DMCA permits you to send us a counter-notice. Notices and counter-notices must meet the then-current statutory requirements imposed by the DMCA. See http://www.copyright.gov/ for details. Notices and counter-notices should be sent to: ECM Enterprises, PO Box 667, Oakley, CA 94561, Attn: Legal Department. We suggest that you consult your legal advisor before filing a notice or counter-notice. You are responsible for complying with United States export controls and for any violation of such controls, including any United States embargoes or other federal rules and regulations restricting exports. You represent, warrant and covenant that you are not (a) located in, or a resident or a national of, any country subject to a U.S. government embargo or other restriction, or that has been designated by the U.S. government as a "terrorist supporting" country; (b) on any of the U.S. government lists of restricted end users. This Agreement does not, and will not be construed to, create any partnership, joint venture, employer-employee, agency or franchisor-franchisee relationship between you and ECM. If any provision of this Agreement is found to be unlawful, void or for any reason unenforceable, that provision will be deemed severable from this Agreement and will not affect the validity and enforceability of any remaining provision. You may not assign, transfer or sublicense any or all of your rights or obligations under this Agreement without our express prior written consent. We may assign, transfer or sublicense any or all of our rights or obligations under this Agreement without restriction. No waiver by either party of any breach or default hereunder will be deemed to be a waiver of any preceding or subsequent breach or default. This, together with all applicable additional ECM guidelines, rules, terms and conditions, is the entire Agreement between you and ECM relating to the subject matter herein and supersedes any and all prior or contemporaneous written or oral agreements or understandings between you and ECM relating to such subject matter. Notices to you may be made via posting to the ECM SITES, by e-mail, or by regular mail, at our discretion. The ECM SITES may also provide notices of changes to this Agreement or other matters by displaying such notices or by providing links to such notices. A printed version of this Agreement and of any notice given in electronic form will be admissible in judicial or administrative proceedings based upon or relating to this Agreement to the same extent and subject to the same conditions as other business documents and records originally generated and maintained in printed form. ECM will not be responsible for failures to fulfill any obligations due to causes beyond its control. To complete and fulfill your transaction, for example, to process your payments, communicate with you regarding your transactions, and provide you with related customer service. For our business purposes, such as data analysis, audits, compliance monitoring, fraud monitoring and prevention, developing new products, enhancing, delivering and/or improving or modifying our SERVICES, identifying usage trends, determining the effectiveness of our promotional campaigns and operating and expanding our business activities. As we believe to be necessary or appropriate: (a) under applicable law or to comply with legal process; (b) to respond to requests from public and government authorities; (c) to enforce our terms and conditions; (d) to protect our operations or those of any of our affiliates; (e) to protect our rights, privacy, safety or property, and/or that of our affiliates, you or others; and (f) to allow us to pursue available remedies or limit the damages that we may sustain. By you, on message boards, blogs, and other services to which you are able to post information and materials. Please note that any information you post or disclose through these services will become public information, and may be available to users of the SERVICES and to the general public. We urge you to be very careful when deciding to disclose your Personal Information, or any other information, on the SERVICES. Using cookies: Cookies are pieces of information stored directly on the computer that you are using. Cookies allow us to collect information such as browser type, time spent on the SERVICES, pages visited, language preferences, and other anonymous traffic data. We and our service providers use the information for security purposes, to facilitate navigation, display information more effectively, and to personalize your experience while using the Services, as well as for online tracking purposes. We can recognize your computer to assist your use of the SERVICES. We also gather statistical information about the usage of the SERVICES in order to continually improve the design and functionality, understand how the Services are used and to assist us with resolving questions regarding the SERVICES. From you: Information such as your general location, as well as other information, such as your preferred means of communication, is collected when you voluntarily provide this information. By aggregating information: Aggregated Personal Information does not personally identify you or any other user of the SERVICES. (For example, we may aggregate Personal Information to calculate the percentage of our users who have a particular telephone area code). Please note that we may use and disclose Other Information for any purpose, except where we are required to do otherwise under applicable law. If we are required to treat Other Information as Personal Information under applicable law, then we may use it for all the purposes for which we use and disclose Personal Information. In some instances, we may combine Other Information with Personal Information (such as combining your name with your zip code). If we combine any Other Information with Personal Information, the combined information will be treated by us as Personal Information as long as it is combined. We seek to use reasonable organizational, technical and administrative measures to protect Personal Information that we maintain within our organization. We also seek to use third-party service providers capable of protecting the information they maintain or process for us. Unfortunately, no data transmission or storage system can be guaranteed to be 100% secure. If you have reason to believe that your interaction with us is no longer secure (for example, if you feel that the security of any account you might have with us has been compromised), please immediately notify us of the problem by contacting us in accordance with the "Contacting Us" section below. If you no longer want to receive marketing-related emails from us on a going-forward basis, you may opt-out of receiving them by clicking on the "unsubscribe" link provided in the email. We will try to comply with your request as soon as reasonably practicable. Please also note that if you do opt-out of receiving marketing-related emails from us, we may still send you important administrative messages, and you cannot opt-out from receiving administrative messages. If you would like to update Personal Information that you have provided to us, you may log into your online account with us or contact us by contacting us in accordance with the "Contacting Us" section below. Thank you for your interest in e-ComplianceManager.com, your cloud based safety and compliance support tool. We encourage our clients and prospective clients to contact us with questions, comments, and concerns. e-ComplianceManager.com offers flexible pricing plans to fit your specific needs. All plans come with unlimited Driver Records, e-Mail Alerts, unlimited forms, and more. Now is the time to test drive our service by taking advantage of our 90-day, obligation-free trial period. For a limited time try our Basic Plan for 90 days at no cost and with no obligation. If you choose to continue then pay the published annual fee otherwise you pay nothing. Becoming a Member is easy, simply complete this form and click the Enroll button. If you need help filling in any field roll your mouse over the field title (i.e. "Company Name") for instructions.